On 6 November 2015, a unique formation flew over the skies of Athens, Greece. As far as we know, for the first time in history, not only for Europe, but also for the rest of the world, a civilian aircraft, flew in formation with three different types of operational military fighter aircraft. George Karavantos was on board this aircraft and brings us a small taste of this unique photo opportunity. 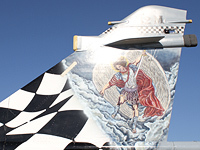 Every year during the first weekend of November, the Hellenic Air Force (HAF) celebrates its Patron Saint Archangel Michael, by opening all its air force bases to the public. People have the chance to see frontline fighters up close and speak with the pilots. 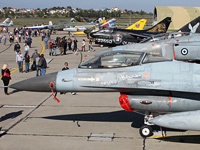 But this year HAF in cooperation with Aegean airlines, the major air carrier of Greece, organized a quite unique event. The strong relations that have been created during the last two years between these two were the reason and birth of this exceptionally good idea. On Friday, November 6, an A320ceo, SX-DGY, one of the newest aircraft of Aegean's fleet, took off from Athens International airport. This special flight, with callsign AEE2000 had a rendezvous in military reserved airspace north of Mikonos. On board this aircraft were 100 lucky winners for their flight of their lives. At the same time three two-seat fighter aircraft, a Mirage 2000-5 BG, a F-16D Block 52+, and a F-4E AUP Phantom II, took off from Tanagra air force base, with in their backseats three veteran air force pilots for their special flight of their lives. These four aircraft met somewhere at 15.000ft for a unique photo opportunity. The aircraft flew in close formation, orbiting at that altitude, and then headed towards Tanagra air base for two memorable low passes. Then, the aircraft landed at the base where all the passengers of the Airbus visited the static display of 114 Combat Wing. Tanagra air force base is the "nest" of the entire Greek fleet of Mirage 2000s, so there were many examples hiding inside the shelters. But for its celebration, the HAF had also redistributed some of its various aircraft types among the major bases across the country. So all the current aircraft types were in the static line-up of the open day. Tanagra also hosts many older aircraft that are no longer in service, almost all of them were on display that day. Apart from the static display, both HAF solo display teams, Daedalus with the T-6 Texan II and Zeus with the F-16C Block 52+ Fighting Falcon, performed their aerobatic displays in the skies over Tanagra air base. The thrilled passengers had a chance to meet the pilots of the other aircraft and have lunch with them inside the 114 Combat Wing's main building. When they finished, they boarded inside the Airbus for their return to Eleftherios International airport.